Let me start be defining what “Lull”, “Dead”, “Lunch” hours are. Some people define them as being from 9AM EST-10AM EST, some stretch it out to 11AM EST and end it at 2PM EST, but for the sake of this article I’m defining them based on my own personal observations and experiences and I’m saying they are from 11:30AM EST – 2:30PM EST. These are the hours where the volume tends to be very light and the action tends to be choppy and/or grinding. 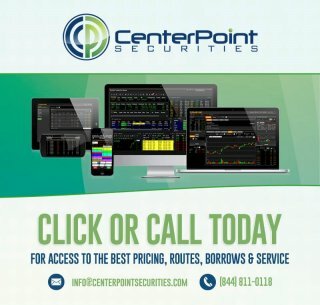 During these hours, the “house” or the market makers have the edge because they are able to manipulate stocks A LOT more easily because of the lower liquidity. Lower volume means they can prop bids and hold down asks with less money and risk to them. Of course, it’s relatively easy to tell that when there’s nothing moving during these hours, (i.e. low volume, sideway charts, grinding charts), you shouldn’t be trading because there are no obvious opportunities. The trouble comes in where you get a random play that moves big on abnormally higher volume during these hours and this is where I admittedly struggle with. Obviously during the slower hours, you’re more likely to get bored, this is why I always emphasize that you need to walk away, but when something starts moving randomly, your eyes are going to open wide open and you’re going to get excited and you’re going to be tempted into trading this random stock that is popping for whatever reason. However, again we are still in the lull hours, the market makers still have the edge here with their algos running in full force and the thing with midday movers you also don’t know how if the market makers have frontloaded the move which adds another dangerous degree of uncertainty when attempting trades on these midday movers. The stock that suckered me in today was VRX. I was up $3.4K on the day up to this point and already recognized that all the tickers from the morning were no longer tradable and I decided to take my usual trader nap. All of a sudden my alert blips and I hear that VRX was tanking. I initially resisted the temptation at first and ignored it but after hearing repeated alerts of VRX tanking I eventually couldn’t resist anymore and got up from my nap and attempted to trade it, which ended up being a very critical mistake. 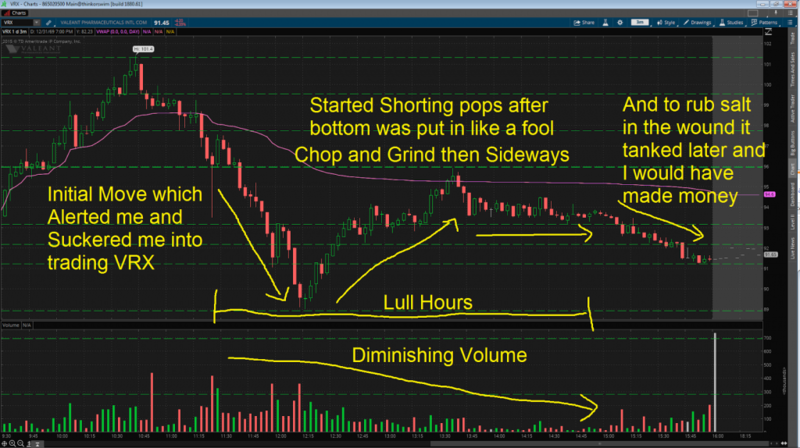 Not only did I attempt to jump into the stock after it already made the move, I also ignored the lower diminishing volume and choppy action as well as the manipulative hidden size orders by the market makers that kept grinding the stock against me. On top of that I kept averaging up, which just compounded the exceptionally poor sequence of decisions that were made in a very short period of time that turned a pretty good day of gains into a sea of deep red. Here’s the chart so you see why it was hard to resist trading this move but also so you can see why it was dumb to trade into it as well. Overall, moving forward, I must resist the temptation of trading during lull no matter how good a trade looks. The market makers have the edge here and their algos WILL chop you up 9 out of 10 times. Trading with size on top of that, is basically just handing your money on a silver platter to the market makers. On occasion I might find a good trade during these hours, but I MUST trade with much smaller size to protect my gains from the morning. Sure I may leave profits on the table sometimes but if that means that I will never flip my solid profitable days upside down ever again, then I’m willing to sacrifice that for the sake of my trading career. Here’s to not getting suckered into trading during lull hours again!.